Direct link to the Harris infosite. 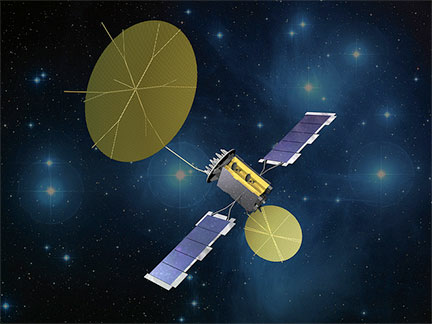 [SatNews] Two unfurlable mesh antenna reflectors developed by Harris Corporation (NYSE:HRS) have successfully deployed onboard the second Mobile User Objective System (MUOS) satellite built by Lockheed Martin Space Systems Company, Sunnyvale, California. The satellite launched July 19th from Cape Canaveral Florida onboard an Atlas V rocket. The announcement was made during MILCOM 2013, which is being held from November 18-20 at the San Diego Convention Center. MUOS will provide military users with 16 times more narrowband tactical satellite communications capability than existing UHF satellites, delivering superior data rates and access to on-demand voice, video and data. The MUOS satellite, developed for the U.S. Navy, leverages the latest advances in cellular and satellite technology, while maintaining compatibility with legacy systems. This is the second of five MUOS satellites scheduled for deployment. Harris is scheduled to build 10 reflectors for the MUOS constellation, two per satellite—a 14-meter diameter unit for multiple-beam operation that significantly increases the number of users and traffic the system can support and a 5.4-meter diameter unit for legacy operations. The gold mesh reflectors are secured to the satellite by Harris precision booms. The reflectors are manufactured at the company's state-of-the-art manufacturing facility in Palm Bay, Florida. "This second on-orbit deployment demonstrates our success in providing unfurlable reflectors to support MUOS satellites," said Bill Gattle, vice president and general manager, National Programs, Harris Government Communications Systems. "We are committed to placing the most advanced communications technology in the hands of our warfighters." Harris also is playing a central role in developing tactical radio terminals that will provide MUOS satellite communications capability to the end-user. MUOS capability will initially be provided via a software upgrade to the widely fielded Harris Falcon III® AN/PRC-117G manpack radio platform. Of the Harris wideband radios already deployed to users, more than 30,000 are ready to host the MUOS waveform software.